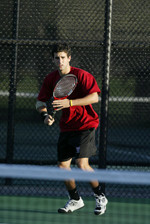 The Harvard men's tennis team has selected Gideon Valkin and Scott Denenberg to lead the Crimson in the 2006-07 season. Sophomore Ashwin Kumar received the John M. Barnaby Award and Senior Brandon Chiu was awarded the Alden J. Bryan Most Improved Player honor. The duo of Valkin/Denenberg received second team All-Ivy League honors after going 12-2 in dual meets, and picked up an 8-4 victory over Pedro Rico and Ivor Lovrak of National Champion Pepperdine. Chiu, a co-captain with Caleb Gardner this season, went 6-13 in singles this season and 13-11 in doubles. He finishes his career with a 29-31 singles record, and a 23-17 doubles mark. Kumar went 10-9 in dual matches this season, finishing with an overall record of 14-12. He posted a 14-11 record in doubles, and was selected to the 2006 NCAA Doubles Championship with partner Sasha Ermakov. The 55-ranked team fell 6-3, 7-6(4), to No. 19 Pramod Dabir and Ryler DeHeart of Illinois in the first round. The duo finished the season with an overall record of 10-6. Kumar/Ermakov received first team All-Ivy League honors, as well as picking up the UVA Fall Classic Doubles title.